The ornate lobby of the Essex County Hall of Records in Newark was filled with people on May 4, colleagues, family members, and friends who had gathered to see two of their own being honored. 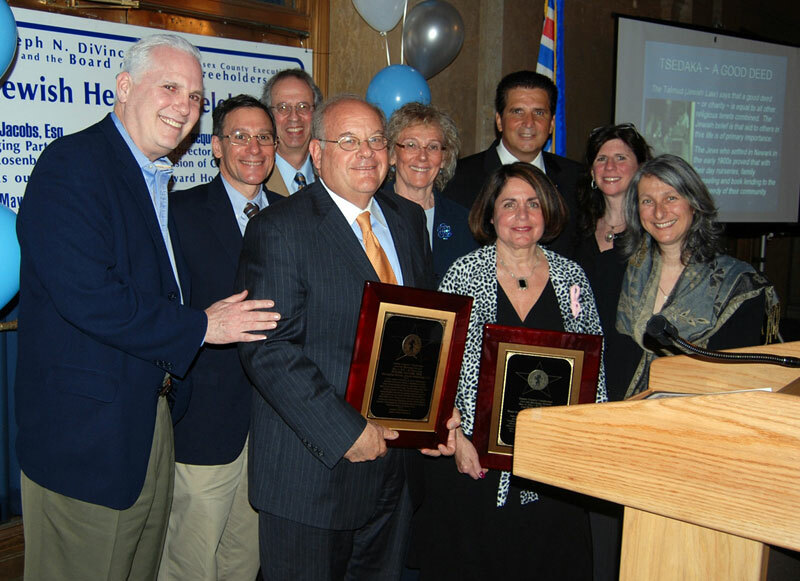 Roger Jacobs, managing partner of Jacobs Rosenberg LLC and a longtime activist with United Jewish Communities of MetroWest NJ, and Jacqueline Yustein, director of the Essex County Division of Community Health Services, were given the Stars of Essex County Award at a ceremony hosted by County Executive Joseph N. DiVincenzo, Jr. The event was part of Jewish American Heritage Month, which is celebrated each year, as are months to honor others who contribute to the diversity of the county, including African-American, Irish, Italian, Latino, and Portuguese citizens. As a backdrop to the speeches there was a video describing Jewish history in the region and the contributions, cultural and economic, made by Jews, including — on the light side — bagels, television comedies, and beloved Christmas songs. 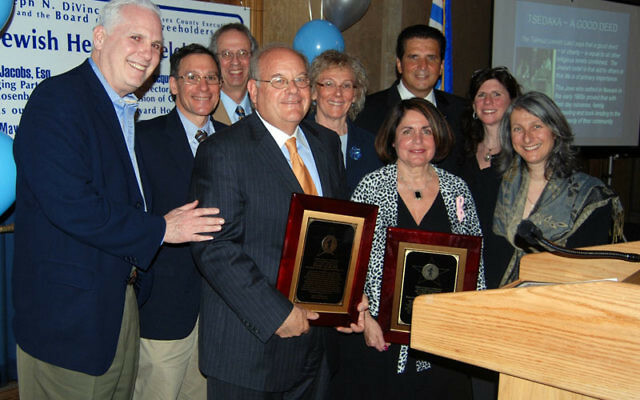 Jacobs, a West Orange resident and former chair of the Community Relations Committee of MetroWest, has served in the leadership of numerous organizations, dealing with labor relations, sports law, and the Boy Scouts, among others. He is currently a UJC board member, cochair of the CRC’s Newark Advisory Council, and a member of the board of the NJ Educational Facilities Authority; he was recently appointed to the NJ Public Broadcasting Authority. Yustein, who lives in Glen Ridge, also spoke of her family, from her grandparents to her grandchildren. A longtime political activist and community volunteer, she has served on numerous organizations and is a member of the Glen Ridge Board of Health and the Essex County Human Services Advisory Board. She was a councilwoman in Glen Ridge in the mid-1990s, and has worked for environmental, historic, and cultural causes as well.